The unwary amongst the bunnies might, given provocation, search Beltsville Laurel USHCN. Were a bunny so foolish the bunny would quickly run into some spit flecked harumphing from Steve Goddard, aka Tony Heller, or visa versa. Unlike Eli Steve Tony can't keep his selfs strait, but no, never mind. The title of the piece is Extreme UHI fraud at NOAA and, like most of Willard Tony's dastardly discoveries, the answer is nu?. (By the way, Surface Stations could use a spring cleaning). Steve Tony's claim has two parts. First that NOAA closed a perfectly good long running station in Laurel Maryland. Laurel is roughly half way between Baltimore and DC, about 20 miles from each. As an older suburban area, it is pretty well developed. NOAA has 16 USHCN stations in Maryland, but they have stopped collecting data from all but four of them. One of the disappearing stations is at Laurel, which has been collecting since 1895 – but no data reported since August 2015. The USHCN station was over to the left (west) side of the D interchange. 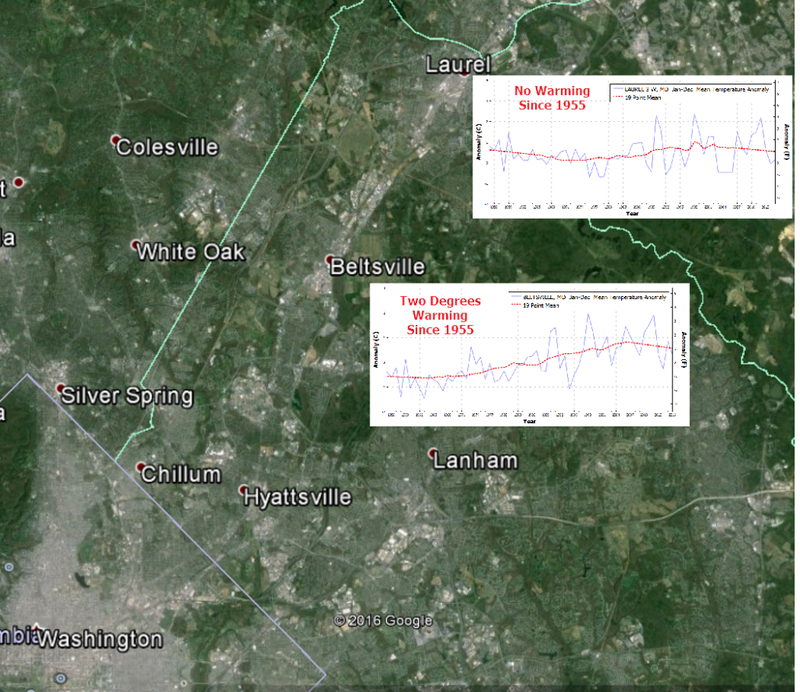 Beltsville (at I-95 and The Beltway) is five miles closer to Washington DC and shows two degrees warming during that period as the city has expanded. Beltsville is one of the four stations still reporting. with a red dot right on I-95 where Beltsville is. 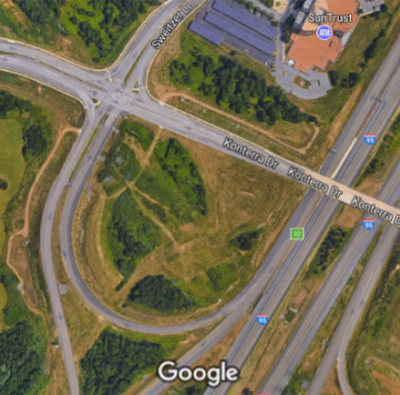 However, as anybunny who lives in the DC area knows, that is not I-95, but US 1. And, again, as DC folk know, Beltsville is where the USDA has its experimental farms. The Beltsville station has moved about. There have been nine locations on the various farms, starting to the east of US 1 in 1931 and now sitting to the west (nearer to 95, but not nearly as close as the Laurel site was right in an interchange. The dot shows the current location. The metadata shows that the station has always been located on farmland. So much for Steve Tony. ** New Rabett Run name for those who deny global warming to advance a political agenda. First two paragraphs are duplicated. What distracted Steve-Tony's cohort from investigating the UHI potential of Las Vegas the last time they convened there? Be careful Russell. You're getting too nice for that den of thieves who pretend to represent Republicans these days. You're already too honest for them. Thanks Eli, Steve-Tony is a beloved opponent, he's so dumb he thinks down is up and up is down. Heller* needs to seriously think about his meme that it's not CO₂ that's causing the warming signal, but the urban heat island effect. Non-urban records reflect the same signal. Ocean temperature records reflect a conmmensurate warming signal, accounting for the heat capacity of water. The range and phenology shifts of species reflects the warming signal, as do the changes in the cryosphere and the rise of global sea levels. If it's not CO₂ but rather the UHI effect, then there's a profoundly disturbing implication - climate is exquisitely sensitive to urban development, and it must surely have to be curtailed if we're not to ruin the planet for future generations. *Isn't it cute how he chooses as a pseudonym a name in which the first syllable is the antithesis of the first syllable in his actual surname? There's surely psychological gold there waiting to be unearthed. Susan , I confess I voted the Johnson-Weld ticket for a change. Equatorial body waves have the same underlying causes as surface transmission on a so-called topological insulator.